Many web users are not too thrilled about auto-playing media, whether it’s autoplaying video or autoplaying sound, or even an autoplaying ad, it can be annoying and frustrating to encounter as you browse the web. But don’t sweat it too much, because modern versions of Safari for Mac allow users to easily disable all auto-playing video and autoplaying audio content. You must have Mac OS with a modern version of Safari or Safari Technology Preview to have this feature easily available. Safari 11 or later will include this capability, whereas earlier versions will not, however older versions of Safari on Mac can stop autoplaying video with a Debug trick described here. You can update Safari via the App Store Updates tab, and anyone can optionally download and install Safari Technology Preview if you want to run a beta version of a modern Safari version, it will install concurrently to the regular Safari release. 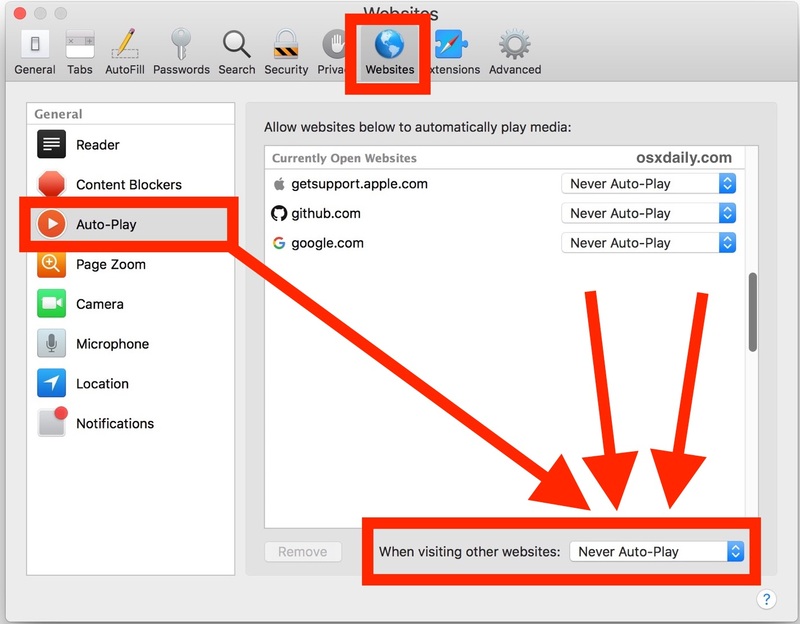 And yes you can also disable autoplay in Chrome, but we’re focusing specifically on disabling autoplay in Safari here. Now you can browse the web without having to worry about auto-playing media blasting unexpectedly . You may need to quit and relaunch Safari for the change to take effect everywhere. * You can set exclusions by choosing the per-site settings and allow specific sites to autoplay video if desired, or allow autoplay on every website except for a particular site, and so on. That’s up to you. 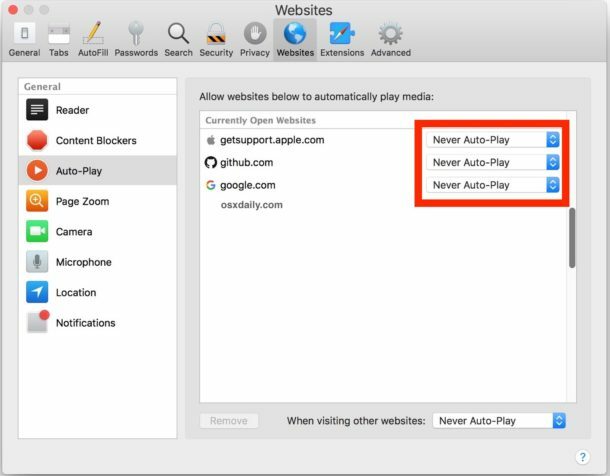 As specified above, if you do not have the “Auto-Play” settings section of Safari Preferences and the ability to choose “never auto-play” then you are not running a modern version of Safari that supports the feature. You must have Safari 11 or newer. You can either update Safari to a newer version, or you can follow instructions to stop autoplaying video in earlier Safari builds. What About Disabling Auto-Play Elsewhere? Do you have any rants, thoughts, tips, or tricks about managing or disabling auto-play media, whether video or audio? Share them with us in the comments below. For some reason this feature does not work for me, in spite of signing Never Autoplay everywhere.